Is it possible to redirect an asteroid if it were hurlting toward Earth? The movies Armageddon and Deep Impact centered around the idea, but the European Space Agency (ESA) is looking to put it to the test. The ESA is planning to launch a mission to redirect an asteroid to see if it's possible to prevent a hypothetical asteroid from colliding with our planet. 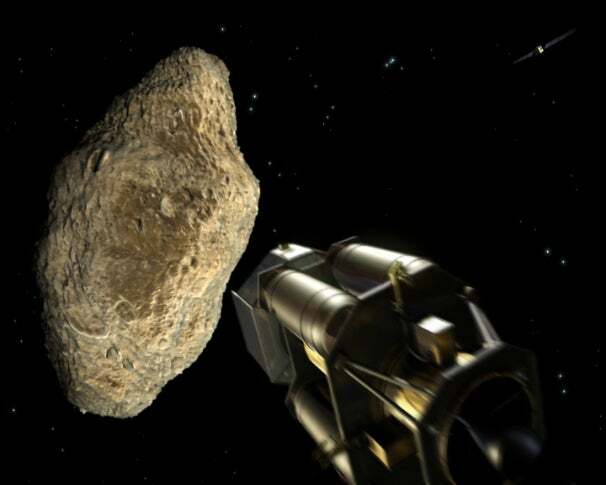 The real-life version will happen in 2015 with a satellite fired at a test asteroid. The target in question is a 1600-foot-wide asteroid called 99942 Apophis, which has a one-in-250,000 chance of hitting Earth in 2036. The mission is being called Don Quijote, and it will involve two spacecraft. A 500kg impact craft called Hidalgo will collide with the asteroid at six miles per second (21,600 mph). Meanwhile, an orbiter called Sancho will scan the collision and monitor whether the asteroid changes direction at all. Sure, it’s not as impressive as the silver-screen version with nuclear warheads, Aerosmith, or slow-motion cinematography. But this is a good chance for scientists to experiment with a what-if scenario. Let’s just hope they don’t accidentally redirect it our way.